If you are traveling to Japan, knowing how to bow properly is a useful skill. Imagine visiting the United States or any country in the West and not knowing how to shake hands. That's how important bowing, known as ojigi, is in Japan. In fact, people commonly greet each other by bowing instead of using a handshake, and it's typically impolite not to return a bow when someone greets you with one. With this brief overview, you'll learn the basic facts about the custom and how to improve your technique. The better your bow, the better your cultural fluency. Probably no gesture in the West compares. A handshake, head nod or kiss on the cheek certainly can't convey this complex range of sentiments. Bowing may seem simple, but there are many different ways to bow in Japan. Foreign dignitaries who visit the country are typically coached on the appropriate way to bow there and in what context. It's important to remember that how you bow depends on the social status or age of the person you bow to. If the person is older or of a higher status than you are, it is common to bow deeper and longer, which shows respect. Who counts as a "higher status" person fluctuates, but it's typical to reserve these deep bows for employers, and sometimes teachers. The most informal bow is a bend of about 15 degrees for a casual greeting. 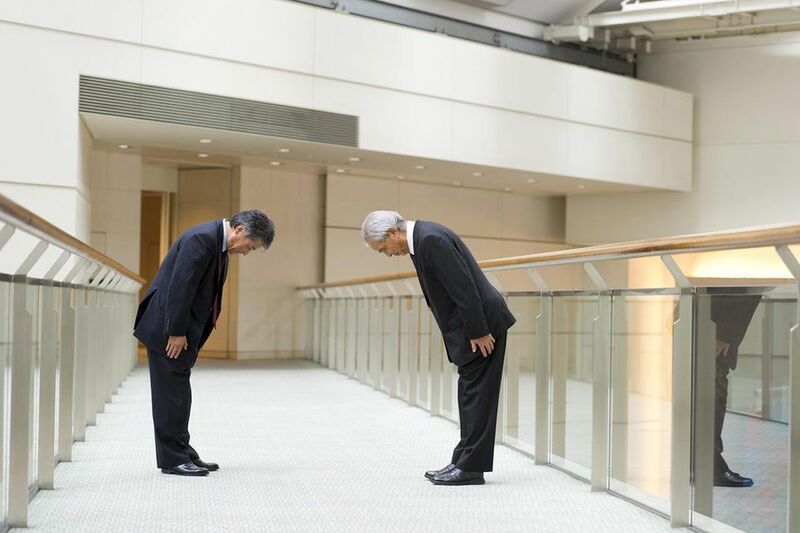 In casual daily life situations, bowing is often a nod of the head. The most popular type of bow in Japan occurs in business or transactional situations, and is done at a 30-degree angle. It's usually intended to greet customers or to thank someone. A more formal way of bowing is performed at a 45-degree angle looking down at your feet. This type of bow signifies deep gratitude, a respectful greeting, a formal apology, asking for favors and similar sentiments. For examples of formal bowing, check out the way heads of state greet Japanese leaders when you see these meetings on the news. If the idea of bowing at a certain angle is intimidating to you, try to at least master the most basic kind of bow in Japan. In most situations, it is polite to bow by bending from your waist with a straight back. Men usually keep their hands in their sides, and women usually put their hands together on their thighs with their fingers touching.